Newtab-tv.com redirects are caused by some kind of adware program. 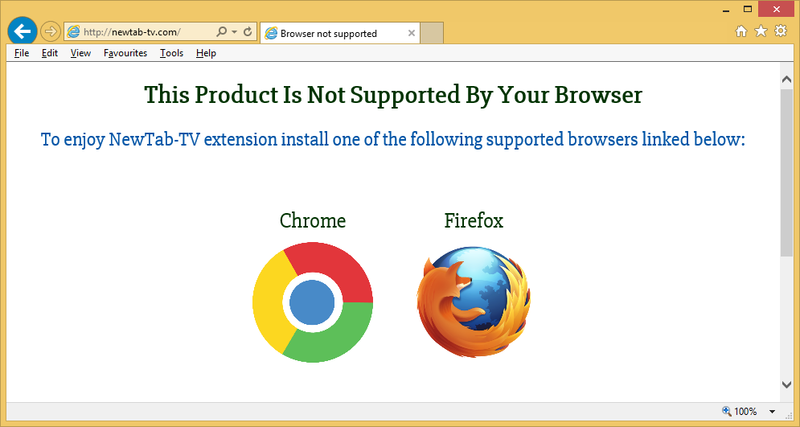 The pop-ups advertise an extension that will supposedly allow you to watch TV. The adware itself is not dangerous and will not affect your computer in a very negative way but it will get on your nerves pretty quickly. It will bombard your screen with ads and pop-ups. Constantly. Which is more than enough reason to delete Newtab-tv.com adware. It will slow down your computer and make your browser crash all the time, which will obviously interrupt your browsing all the time. If you wish to prevent similar infections in the future, you will need to learn how to install freeware correctly because adware uses freeware bundles. You probably recently installed freeware and did not notice that it had adware attached to it. This is not unusual and many users end up missing those attached offers because they are hidden. They are only visible in Advanced or Custom settings when installing freeware so those are the settings you should choose. If you see something being attached, all you need to do is deselect it/them. This will prevent it/them from installing alongside the freeware. Do not use Default settings because they will not show anything. And you will get stuck having to remove Newtab-tv.com adware or similar. You will start seeing advertisements from the moment the adware installs. They will advertise a browser extension which allows you to watch TV online. Whatever you do, do not install it. If it’s free, then you could be installing a highly questionable extension and if you have to pay for it, you could be exposing your personal information to dangerous people. In any case, you should never download any kind of extension, no matter how legitimate it looks, when its ad just suddenly appears on your screen. What you would end up installing is most likely some kind of malware. If you think the advertised program would be useful, first look into, read what other people are saying. And if you still want it, use legitimate/official sites. Not some random pop-up. Unless you want to infect your computer with serious malware. As soon as you notice these advertisements appearing, check your computer for adware. Do not ignore the problem. Because not only will you get ads all the time but your computer will also slow down. Uninstall Newtab-tv.com. Automatic Newtab-tv.com removal might be the quickest option because anti-spyware software would take care of everything for you. If you try to delete Newtab-tv.com manually, you will have to spend valuable time simply trying to find where the hijacker is located. Nevertheless, it is possible to remove Newtab-tv.com manually, it just might take longer. Make sure you uninstall Newtab-tv.com fully so that it cannot renew itself.